The semester is underway and spring break is on the horizon. Whether you’re planning a beach getaway or a relaxing week at home, extra cash is useful. It’s time to save up now so you can treat yourself later! Use our February bonus code and get extra cash added to your order when selling your textbooks. Step 1: Visit Cash4Books.net and input your textbooks’ ISBNs. For a convenient way to sell your books on the go, download our barcode-scanning mobile app for Apple and Android devices. 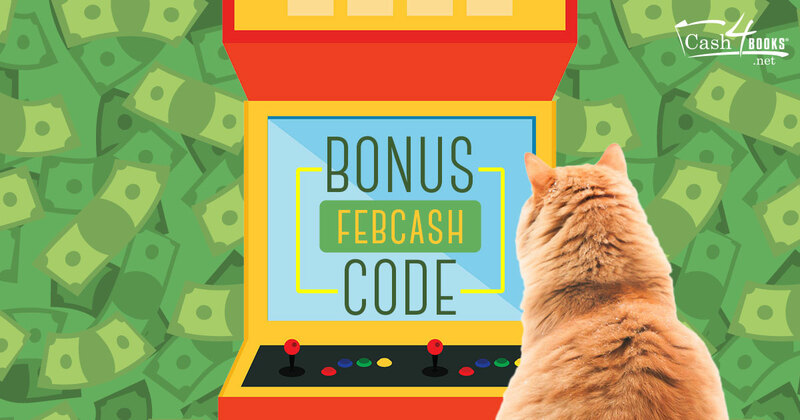 Step 2: Use bonus code FEBCASH at checkout and get 15 percent extra bonus cash added to your order of $15 or more. Step 3: Print the free shipping label and mail us your used textbooks. When we get your books, you get your money. It’s as easy as that. Now it’s time to gather your old textbooks, turn them into cash, and start saving for spring break today! Receive a 15 percent bonus on your next buyback order of $15 or more at Cash4Books.net. Orders must be submitted by 11:59 p.m. PST, February 28, 2017. Maximum $50 order value. Limit one per customer. Cannot be combined with other offers. Cannot be applied retroactively. All books must meet Cash4Books’ Used Book Condition Policy. No cash value. This entry was posted in Cash4Books News & Updates and tagged bonus code, cash, make money on February 1, 2017 by Jim McKenzie Smith.